The The Café is a restaurant inside Santa Claran Hotel Casino in Espanola, New Mexico. This place is fantastic! My wife and I were in NYC for our wedding. We have a friend that lives in NYC that recommended the place. We took our wedding party there the first night in town, and we were thrilled with the food and service. Steak Rancheros for the win!!!! Authentic Spain plates and variety. The octopus in all the preparations delicious... Love this place. Excellent Spanish food, and really good service. 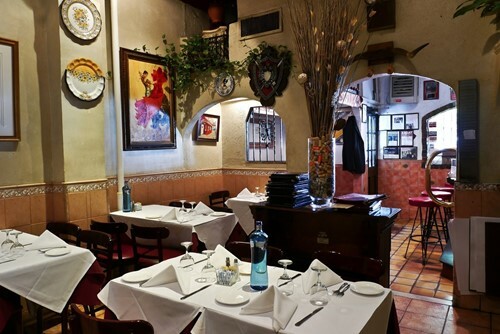 Cafe Espanol is one of our favorite restaurants. There used to be several locations, but this is the last one remaining (and sadly it got even smaller with the elimation of Salon de Tapas). We love the attentive service and authentic cuisine. I highly recommend the 3-course special - a great value! The Paella is also quite good, both Valenciana and Mariscada. I must admit that we were a little disappointed in the Sangria. It used to be so unique - never had sangria as flavorful and with such a "kick". They must have changed the base wine, as it was nowhere near as fruity and robust as before and the "kick" was non-existent, though the headache was 😒. The restaurant is quite tight space-wise (think cozy) and can get loud when busy. There was an outdoor patio in the back at one time, but is was not available on our most recent visit. There's also strolling guitarist who takes requests (and tips 😉). Great European-esque spot for tapas and drinks. Frozen margaritas and the octopus were especially delicious! Love this place. Great food, fun bar and friendly people. The menu offers delicious tapas as well as many traditional Spanish entrees. The flexible menu also offers fish, steak, lamb delicious broiled half chicken and more. Try the flan or the warm moultan chocolate cake. Spent New Years Eve dancing the night away....so much fun. If you you know something about Spanish food it is easy to realized this food is not authentic. The food is very regular and the price is ridiculous over the quality it’s received. I got so frustrated, had a terrible food and paid $260. The waiters were nice but the food is so bad that even a wonderful service won’t fix that. Don’t go to this overpriced place.